SPOT Satellite Personal Tracker is the world's first satellite messenger, Unlike a traditional GPS device which only receives a satellite signal indicating your location, SPOT Satellite Personal Tracker utlises dual satellite networks to receive your location as well as transmit it. 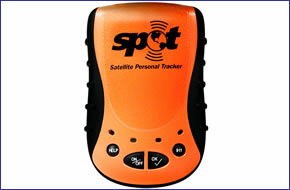 SPOT Satellite Personal Tracker has been discontinued. SPOT Satellite Personal Tracker has been replaced by the SPOT Gen3. With the SPOT Satellite Messenger, you and your loved ones have peace of mind knowing help is always within reach. SPOT is the only device of its kind, using the GPS satellite network to acquire its co-ordinates, and then sending its location - with a link to Google Maps - and a pre-programmed message via a commercial satellite network. And unlike Personal Locator Beacons, SPOT does more than just call for help. Tracking your progress, checking in with loved ones, and non-emergency assistance are also available, all at the push of a button. And because it uses 100% satellite technology, SPOT works around the world - even where mobile phones don't. How does SPOT Satellite Personal Tracker work? Unlike a traditional GPS device which only receives a satellite signal indicating your location, SPOT Satellite Personal Tracker utlises dual satellite networks to receive your location as well as transmit it along with a pre-programmed messages to the recipents of your choice. When SPOT Personal Tracker sends a text or e-mail message to one of your contacts, it inlcudes your exact co-ordinates and a web link to view your location using Google Maps. SPOT works around the world, including virtually all of the continental United States, Canada, Mexico, Europe and Australia, portions of South America, Northern Africa and North-eastern Asia, and hundreds or thousands of miles offshore of these areas. Alert 9-1-1 - Dispatch emergency responders to your exact location - SPOT sends one message every 5 minutes until power is depleted or 911 is cancelled. Ask for Help - Request help from friends and family in your exact location - SPOT sends one message every 5 minutes for one hour or until Help is cancelled. Check In - Let contacts know where you are and that you’re okay - SPOT sends three identical messages to the SPOT service for redundancy. The first of those three messages is delivered. Track Progress - Send and save your location and allow contacts to track your progress using Google Map - SPOT sends one message every 10 minutes for 24 hours or until SPOT is powered off. The SPOT Satellite Personal Tracker is mounted inside on your vehicles windscreen using the suction cup windscreen bracket provided. The SPOT Satellite Personal Tracker can be powered directly either from its internal battery if it's fully charged or powered from the cigarette lighter socket. ‣GEOS insurance (at time of activation only). Annual subscription charge - 11.00Euros.